[XPB-R466S-X} This Round Picnic Table features six individual chair seats with backrests. 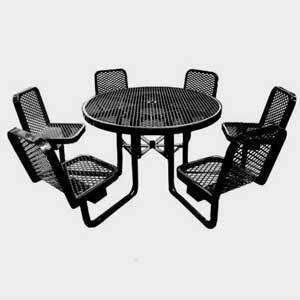 Table top and chairs are constructed of heavy duty expanded metal and coated in Thermoplastic, a durable weather resistant coating. The under structure is protected in a black powder coating. The round picnic table top is 46" in diameter. Choose from 16 Thermoplastic Color Choices. Round picnic tables are available in Portable, Surface or In-Ground Mounting Applications. This table is ADA approved in the portable Handicap configuration. Optional Leg Protectors and Umbrella sold separately. For shipping quotes, discount pricing, orders or questions please call our Customer Service Center at 1-877-483-9270.